With Chat History Search feature, you can filter chat history using keywords used in the chat, specific filters and search queries. You can locate this option on the top right corner under History section in your HappyFox Chat account. You can enter the keyword that you are looking to search in the search bar and hit enter to filter chats with the entered keyword. Example: If you want to filter chats related to pricing, just type the keyword "pricing" or something even more specific to get the results. 1. Handled by you: This filter will list all the chats accepted by you. 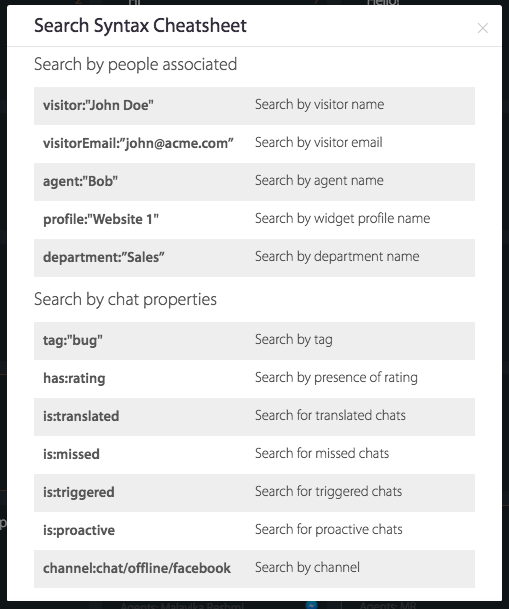 If you want to filter chats accepted by other agents, type the search query - agent:<name>. 2. With Visitor Rating: If you have enabled chat rating feature, you can filter and view the chats with chat rating and feedback. Click the filter or type the search query - has:rating. 3. Missed Chats: Filters all the missed chat when you or other agents. Click the filter or type the search query - is:missed. 4. Offline messages: Filters all the Offline message sent by the customers. Click the filter or type the search query - is:offline. 5. From Facebook: If you have enabled Facebook messenger integration, you can filter all the Facebook messages handled from your HappyFox Chat account. Click the filter or type the search query - channel:facebook. Example 1: If you want filter number of chats missed by an agent under a particular profile and the chats are triggered chats, the following search query can be used to fetch results. Note: Kindly enter space in between the commands. Note: Adding the "-" (minus) symbol in front of a search query will exclude the particular command's results. Example 3: If you want to filter the number of chats by accepted by you/other agent and exclude the missed chats, the following search query can be used to fetch results.